State Champs Again! Nearly Perfect!! BREAKING NEWS. DESERT VISTA BOYS AND GIRLS CROSS-COUNTRY TEAMS CROWNED STATE CHAMPIONS THIS PAST WEEKEND. Ok, so no headline is going to read like that on the front page a daily newspaper so I thought I would take the liberty of writing one myself. Both the Girls and Boys teams captured a state title this year at the Arizona DI State Championship Meet this past weekend. The two teams carried on the Desert Vista dynasty as the Boys won their third straight title in cross-country (an Arizona Division 1 record) while the Girls won their third state title in the past four years. The meet was held at Cave Creek Golf Course in Cave Creek, Arizona and was certainly one for the record books. Usually I only write about the Boys team but I think this meet merits that both teams have their accomplishments recorded. First off for the Thunder was the Girls team who put on a dominating performance. Junior Haley Wolf was the first Thunder runner to cross the finish line, taking second place with a time of 18:30. Following her was senior Baylee Jones (18:31) in 3rd, senior Emily Crall (18:35) in 4th, freshman Brooklyn Christofis (18:38) in 5th, and senior Mandy Davis(18:39) in 6th. Yes you read that right, five Thunder runners finished in the top six spots in the meet. Following this pack, with equally impressive times, was junior Kelly Harris (19:17) in 12th and senior Madi Bucci (19:55) in 28th. The Girls team scored a combined team score of 20 points (another DI record) beating second place Chandler by 85 points. Overall Desert Vista posted unbelievable performances at the State Meet that will surely be remembered for many years to come. Both teams showcased why they are in fact the premier teams in Arizona. All the grind during the season certainly paid off and showed why hard work is important. 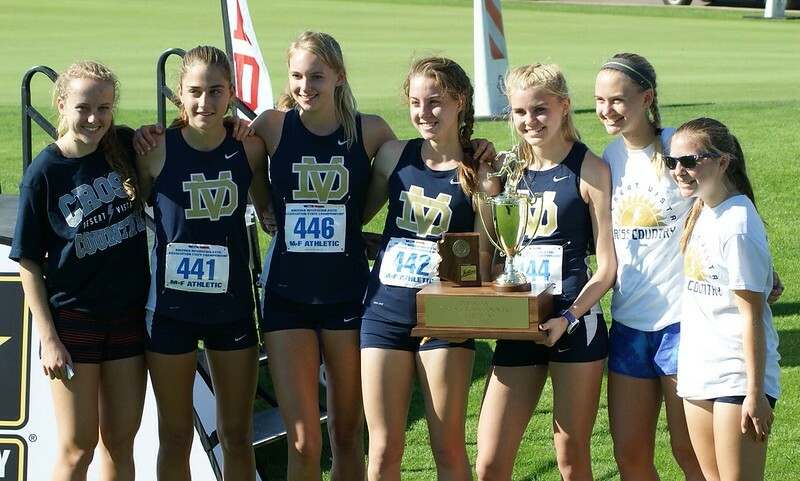 Neither team can have a championship hangover though, as the Nike Cross Regionals (NXR) is on the horizon. At NXR the best teams in Arizona, Colorado, Nevada, New Mexico, and Utah all converge in Casa Grande to try and qualify for the Nike Cross Nationals (NXN) in Oregon, a feat only one Thunder team has done in the past. Both teams certainly have the potential to qualify. Potential is just a word though, what really matters is action. If both teams put into action the training they have done all season, there is no reason why we cannot emerge on top. As always a huge thank you is in order for the coaches, parents, and boosters who are the backbone of Desert Vista Cross-Country. All of the amazing accomplishments of the team are not possible without your help and I hope all of you know that.